The 2015 Subaru Impreza offers a little something for everybody. There's the compact sedan and hatchback, with standard all-wheel drive, on the lower end. Those looking for a little more sizzle can opt for the high-performance WRX and WRX STI sedans. This year, the new WRX models share the same body as the rest of the Impreza line. Satisfactory overall feeling while driving. The car has a good respond on power ratio, with a great sense to transmit what is happening in the road, de 4 wheel drive system is very good on stability, make you feel the is in control maintaining the car always in the position where you have the steering, gas mileage is good about 35 miles per gallon engine noise give you a satisfactory sporty feeling, the interior is roomy and comfortable on a vehicle that is not big overall, doors open wide good if you try to push inside an ikea box, trunk is big also with great access doors close with a soft touch with a satisfactory sound that make you feel that parts belong to each other, buttons, switches have a great feeling that even if you are not looking you know that you move something also have a good feeling to the touch, great visibility from the inside to the outside. 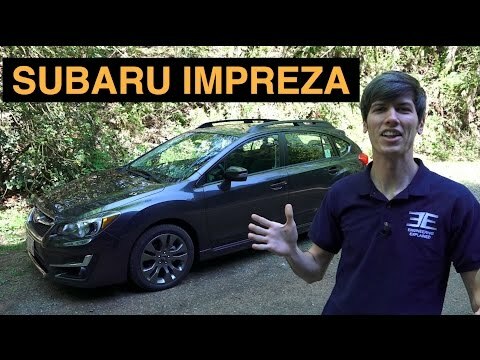 Subaru Impreza review - some of the good and bad. The Subaru Impreza is a reliable, amazingly functional car. It performs well in the winter, does not slide too much on the ice. Amazing in the woods, much better than what I had expected it to be. Good speakers, I love the rear view camera, warms up quick. Especially the seat heaters. The downsides are that it does have a lot of lights constantly turning on for no reason, and then turning off the next time it's started, or, as I have recently experienced, the gas cap being loose can cause lights to turn on, the car to lose power, essentially making it useless. Overall, I love the car, I live for Subaru's, and i'd buy this car again if I had the chance. 2015 Subaru Impreza provides excellent ride control. The 2015 Subaru Impreza sport limited has exceptional steering and control. Cornering is excellent and it feels that it can climb nearly any hill in any condition. It handles consistently through wet or snowy road conditions as it does on dry land (well almost and so much closer than other rides). I'd request they work on a better dashboard and steering wheel control layout - screen is good size but slight higher would be better - placing the screen above the vents would be my advise.